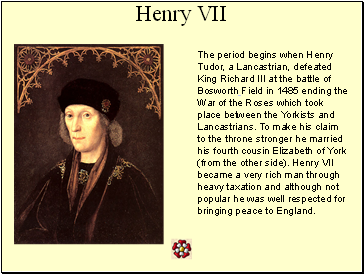 The period begins when Henry Tudor, a Lancastrian, defeated King Richard III at the battle of Bosworth Field in 1485 ending the War of the Roses which took place between the Yorkists and Lancastrians. To make his claim to the throne stronger he married his fourth cousin Elizabeth of York (from the other side). Henry VII became a very rich man through heavy taxation and although not popular he was well respected for bringing peace to England. In 1509 Henry VII died leaving a strong and safe crown to his eleven year old son Henry VIII. 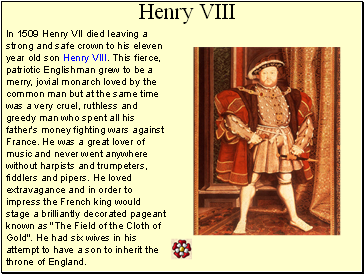 This fierce, patriotic Englishman grew to be a merry, jovial monarch loved by the common man but at the same time was a very cruel, ruthless and greedy man who spent all his father's money fighting wars against France. He was a great lover of music and never went anywhere without harpists and trumpeters, fiddlers and pipers. He loved extravagance and in order to impress the French king would stage a brilliantly decorated pageant known as "The Field of the Cloth of Gold". He had six wives in his attempt to have a son to inherit the throne of England. Henry VIII's only son Edward, at age 9 became known as Edward VI 'The Boy King' when Henry died in 1547. Edward's uncle, the Duke of Somerset and later the Duke of Northumberland ruled England in his name. 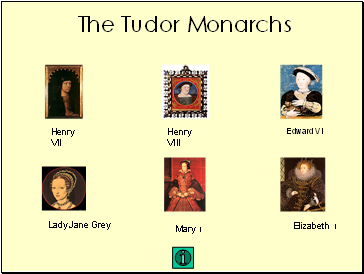 As his father had closed all the monastery schools new grammar schools were started to teach reading and writing and the most important subjects at that time were Latin, Greek and Mathematics The monastery hospitals had also disappeared so Edward commissioned four Royal hospitals be built in London. 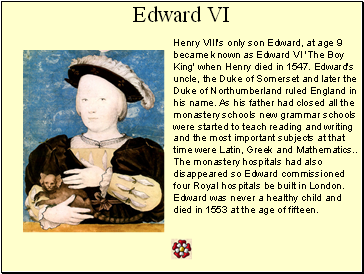 Edward was never a healthy child and died in 1553 at the age of fifteen. 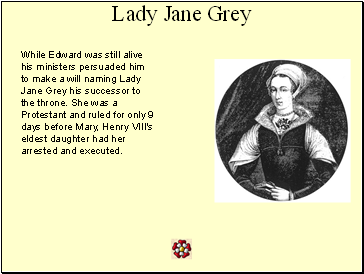 While Edward was still alive his ministers persuaded him to make a will naming Lady Jane Grey his successor to the throne. She was a Protestant and ruled for only 9 days before Mary, Henry VIII's eldest daughter had her arrested and executed. 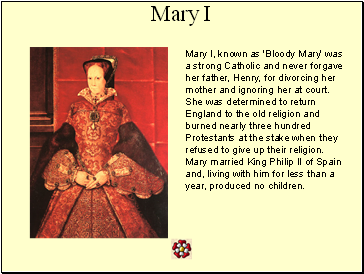 Mary I, known as 'Bloody Mary' was a strong Catholic and never forgave her father, Henry, for divorcing her mother and ignoring her at court. She was determined to return England to the old religion and burned nearly three hundred Protestants at the stake when they refused to give up their religion. Mary married King Philip II of Spain and, living with him for less than a year, produced no children.